Anonymous;Code is a visual novel video game in development by 5pb. and Chiyomaru Studio, and is planned to be released by 5pb. for PlayStation 4, PlayStation Vita and Nintendo Switch in Japan. It is part of a media franchise referred to internally as Science Visual Novel, which also includes Occultic;Nine. In the year 2036, the "2036 Problem" occurs, where an incident involving computers leads to the destruction of major cities around the world. A similar event is expected to take place in 2038, so a supercomputer called Gaia is used to create an alternate Earth using an Earth Simulator in order to study the possible effects of the impending catastrophe. The experiment was initially inconclusive because of the possibility of low birth rates in the alternate Earth, so a message called the Arecibo Message was used to allow humans to live there. However, humanity in the alternate Earth then create their own Earth Simulator leads to questions about the original Earth's existence. The game takes place in 2037. The protagonist, a hacker named Pollon Takaoka, has an ability which allows him to save and load moments, much like save features in video games. 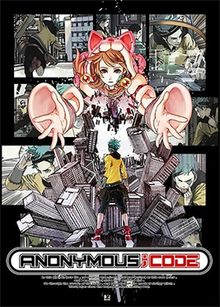 Anonymous;Code is developed by Chiyomaru Studio and 5pb., and is written by Chiyomaru Shikura. It is the first stand-alone work developed by Chiyomaru Studio, and is part of a franchise referred to internally as Science Visual Novel, which also includes Occultic;Nine and is separate from the developers' Science Adventure series. In contrast with the concept of infinitely expanding horizontal "world lines" used in Shikura's Science Adventure game Steins;Gate, Anonymous;Code uses the concept of infinitely expanding vertical "world layers", with the main character being able to manipulate layers below his, and is themed around hacking. Shikura stated that he initially wanted to increase the game's immersion by applying a unique artwork to every scene and using full animation during major events. However, he realised the game would need at least 3000 different artworks (in contrast to the usual 100 found in visual novels), not counting the costs to produce the animations, and thus discarded this idea. His research on how to lower the costs of an immersive visual novel led him to consider reusing old animation, developing Steins;Gate Elite from this idea. The game is planned to be released by 5pb. for the PlayStation 4, PlayStation Vita and Nintendo Switch in Japan. ^ a b Ishaan (2015-03-29). "Anonymous;Code Is 5pb's Next Sci-Fi Visual Novel". Siliconera. Curse, Inc. Archived from the original on 2016-01-01. Retrieved 2016-03-29. ^ "Anonymous;Code Visual Novel's 1st 2 Characters Revealed". Anime News Network. 2016-03-07. Archived from the original on 2016-03-27. Retrieved 2016-03-29. ^ Token (2016-07-03). "【5pb.祭り2016】「ANONYMOUS;CODE」ステージでは"セーブ＆ロード"を用いる新システム「ハッキングトリガー」が明らかに！". Gamer (in Japanese). Ixll Co. Archived from the original on 2017-01-08. Retrieved 2017-01-08. ^ "本作のトリガーは"ハッキングトリガー"！？ 『アノニマス・コード』の見どころについて志倉千代丸氏が語る【5pb.祭り2016】". Famitsu (in Japanese). Enterbrain. 2016-07-03. Archived from the original on 2016-08-21. Retrieved 2017-01-08. ^ Romano, Sal (2015-03-28). "5pb. announces Anonymous;Code". Gematsu. Archived from the original on 2016-03-10. Retrieved 2016-03-29. ^ "志倉千代丸氏インタビュー　『シュタインズ・ゲート エリート』は"ゲーム以上でいて、アニメ以上"". Famitsu (in Japanese). Enterbrain. 2017-09-21. Archived from the original on 2017-09-29. Retrieved 2018-02-14. ^ "『シュタインズ・ゲート』と『ロボティクス・ノーツ』の新作などが発表――ライブイベント"チヨスタライブ"での発表内容をお届け！". Famitsu (in Japanese). Enterbrain. 2017-05-28. Archived from the original on 2017-05-28. Retrieved 2017-05-28. This page was last edited on 28 October 2018, at 15:01 (UTC).